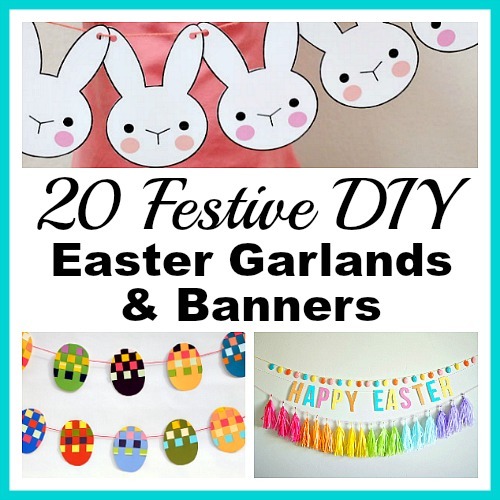 20 Festive DIY Easter Garlands and Banners- Frugal Decor Ideas! One of my favorite ways to decorate for any holiday is with a garland or banner! Sometimes I can find a cute garland for a low price in Target’s dollar spot, or in Hobby Lobby during after-holiday sales. But the rest of the time, if I want a garland/banner (and don’t want to spend a ton) I just make one myself! Making your own banner is actually really easy. Some of the ones below are just free printables that you cut out and hang up on string, and others take some basic crafting skills. Either way, you can create a nice piece of decor pretty quickly if you choose to make a DIY garland or DIY banner! To give you some ideas for fun Easter DIY decor, take a look at these 20 Festive DIY Easter Garlands and Banners! I put my garlands and banners on my fireplace mantel, and before I had a real fireplace I used to put them on the DIY faux fireplace in our old house. But if you don’t have any kind of mantel, you could hang your garland/banner on your wall, across your china cabinet, across a wide piece of furniture (like a dresser), across your stair balusters, across a window, or even across a door (if the garland/banner is short enough). There’s definitely somewhere in your home that would be the perfect place to display one of these DIY Easter garlands and banners! All of these DIY Easter banners and garlands are easy (and fun) to make, and are a wonderfully frugal way to update your decor for Easter! There are so many fun homemade garland ideas in the links above! And there’s no reason to limit yourself to just one. 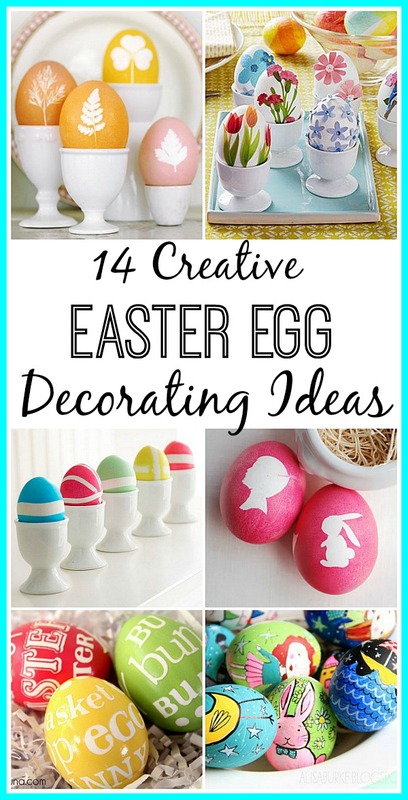 Why not make one for one area of your home, and another for a different area to spread the Easter cheer! Do you usually hang up a garland or banner for Easter? Yesterday I donated a little shelf that I could’ve used to make an Easter shelf like yours. I am so wanting a do-over on that donation! Today, after I saw your Easter shelf in your post, I wrote a post telling how I would convert my old shelf into your lovely one. I used your picture and linked to your post. I am going to at least make that adorable banner. Love, love, love your Easter shelf. Cute round-up. Will have to check out the various ideas. Love the weaved eggs! Visiting from Sundays at Home party.